Marco Pierre White, the celebrated British chef, once said: “Gastronomy is the best greatest form of therapy anyone can be exposed to”. If Marco is right, the streets of Mumbai are nothing less than therapy centers. Whether you are feeling happy or sad, had a good day at work or a really bad one, fell head over heels in love or had a bad break-up, the city’s street food will lift your mood instantly. 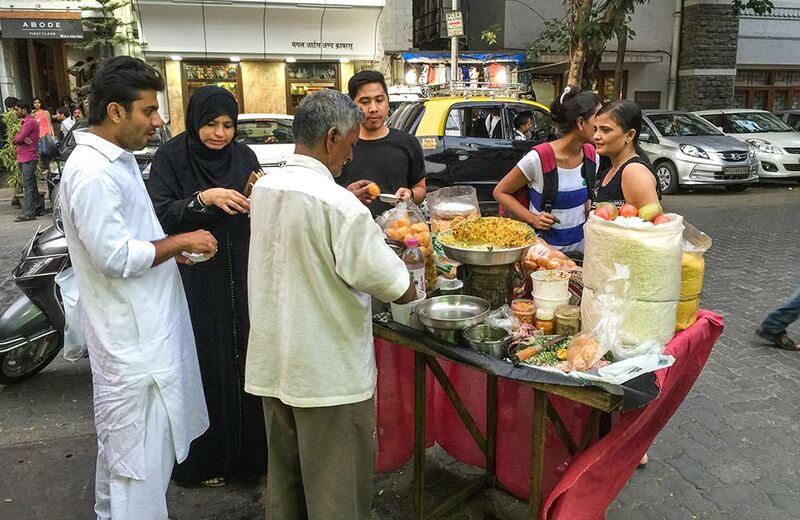 When we say street food, we are not talking about ten or twenty shops dotted here and there on streets; we are talking about hundreds of them, each better than the other. And, the food these serve will put even the signature items in Michelin-star restaurants to shame. So, are you ready for a gastronomical tour through the food streets of the city? Read on as we give you a rundown of 10 popular items the city plates up for you along the best places to eat street food in Mumbai. 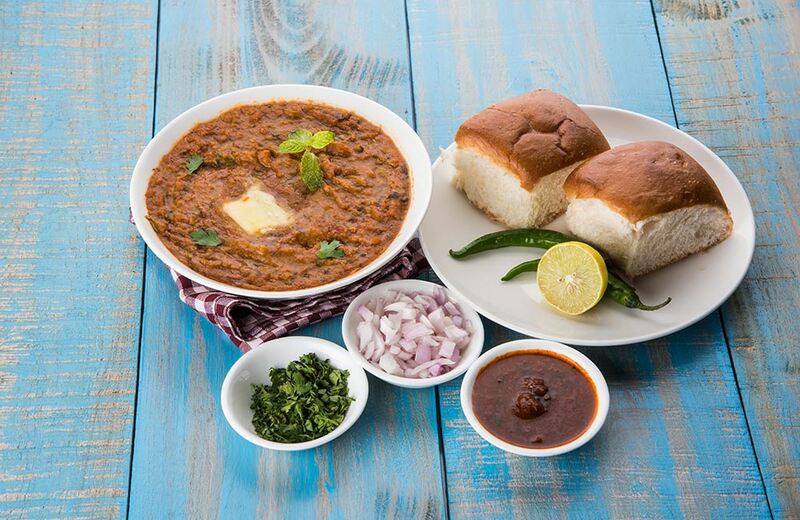 Let’s start with a dish with a history of over 150 years and pretty interesting at that – Pav Bhaji. Originating during the 1850s as a lunchtime dish for the city’s textile workers, it went on to become the most sought-after street food dish in Mumbai. The dish consists of two parts – a thick curry made from mashed vegetables with spices, and fluffy bread rolls buttered lavishly. The curry is usually topped with a slab of butter, and yes, one look at this dish is enough to make you its lifelong fan. What’s more? The dish has a number of variants, such as Cheese Pav Bhaji, Paneer Pav Bhaji and Mushroom Pav Bhaji. So, go to a street shop, get a plate of this lip-smacking delicacy, and dig in with your fingers. Remember, Pav Bhaji is such a heavenly dish that it’s considered a crime to leave the city (or live in it) without trying it. 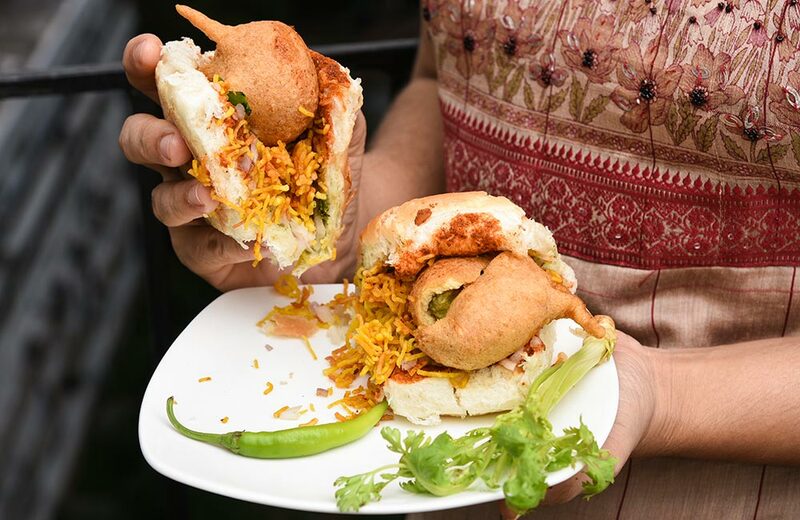 One of the most widespread and easily available street snacks in the city, Vada Pav is also known as India’s vegetarian burger. Can you Guess why? In its physical form, the snack resembles a burger – it consists of a batter-fried potato patty (called Vada) placed between a bread bun (called Pav) sliced in half. When you order a plate of Vada Pav, it usually comes garnished with one or more chutneys, both sweet and spicy; the fried chilies served along with it are sure to give you a burst of heat. This grab-and-go snack is the best way to lift your spirits on a gloomy day or after a hard day’s work. Try it with a glass of chai, and ah, blissful it is! How often do you come across snacks that are not just tasty but also a delight to watch being prepared and absolute fun gobbling down? Well, Pani Puri is one such street snack. 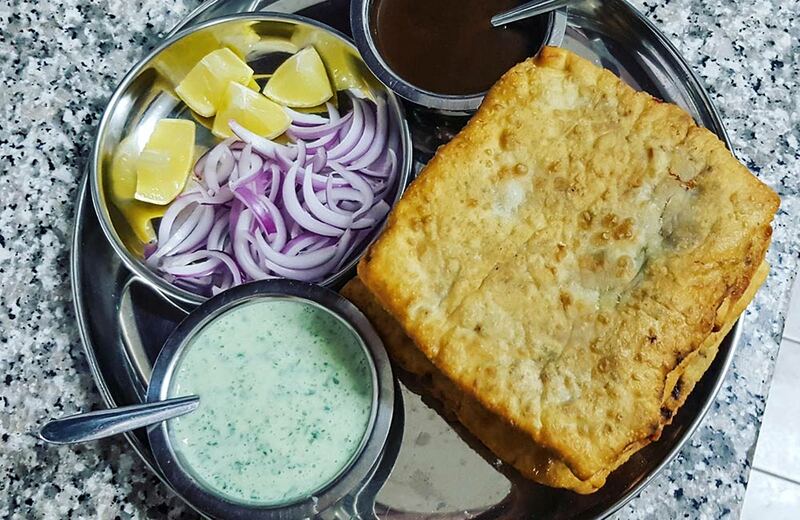 Small crispy puris are first poked with a thumb to ae a hole, then half-filled with a mixture of chickpeas, potatoes, onion, and chilies, and finally dunked into flavored water known as imli pani. To stop the puri from getting soggy, you should eat it immediately after the vendor hands it to you. And, get ready for the best part, you have to eat it whole. The sweet and sour water fills your mouth along with the savory flavors of potatoes and chickpeas, tickling your taste buds like nothing else. Of all the street snacks in Mumbai, this is an absolute stunner and for all the right reasons. However, you should be a little careful about where you eat it. Our two cents – eat from street stalls that use mineral or filtered water unless you want to end up with an upset stomach. Remember the song, “Main toh raste se ja raha tha, Main toh bhel puri kha raha tha” (I was walking through the road, I was eating Bhel Puri) from the 1995 comedy film Coolie No.1? Believe it or not, every true Mumbaikar must have done this – walking through the road eating Bhel Puri – at least once in their life. And now, it’s your turn to join the pack. All you need to do is head to any of the busy beaches or streets in the city, and you will find this all-day snack right there at the stalls. 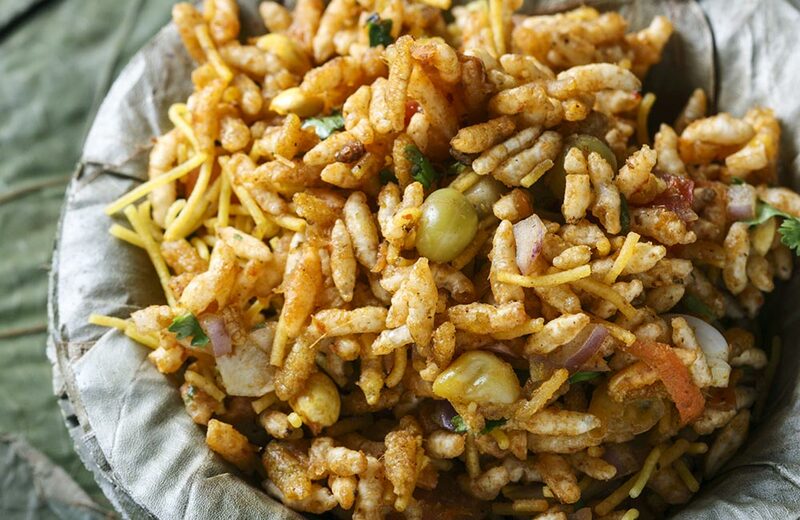 The snack is pretty simple, consisting of puffed rice and sev, into which chopped potatoes, onions, and tomatoes are added. A variety of chutneys are also added to this mix, making it sweet, tangy, and spicy, all at the same time. You can find different variations of the dish based on how vendors prepare it, but the balanced flavors of this mouth-watering snack will make you an instant addict. And, you will be walking through the road eating it, just as the song says! Your gastronomical experience of touring through the city will fall flat if you don’t add one item to your must-eat list – a plate of Ragda Pattice. The preparation of this flavorful dish has two parts – ragda (a soft stew made using chickpeas and spices) and deep-fried pattice (patties) made with mashed potatoes. When you order a plate of this dish, you will get two pattices drowned in ragda. The dish is garnished with chopped onions, green chutney, coriander leaves, tamarind chutney, and sev, giving this quintessential Mumbai chaat the final form. No wonder, it ranks top among the best veg street food dishes in Mumbai. By now, any seasoned and intelligent foodie must have started wondering if Mumbai’s street food is all about vegetarian delicacies. All you carnivores out there, we have got good news for you: the city’s streets are havens for meat eaters. The number of non-veg stalls here and the items they serve will make you drool like a child. When you want to explore the best non veg street food in Mumbai, start with kebabs and rolls. Skewered kebabs are an absolute stunner of a street food, to say the least. Don’t believe us? 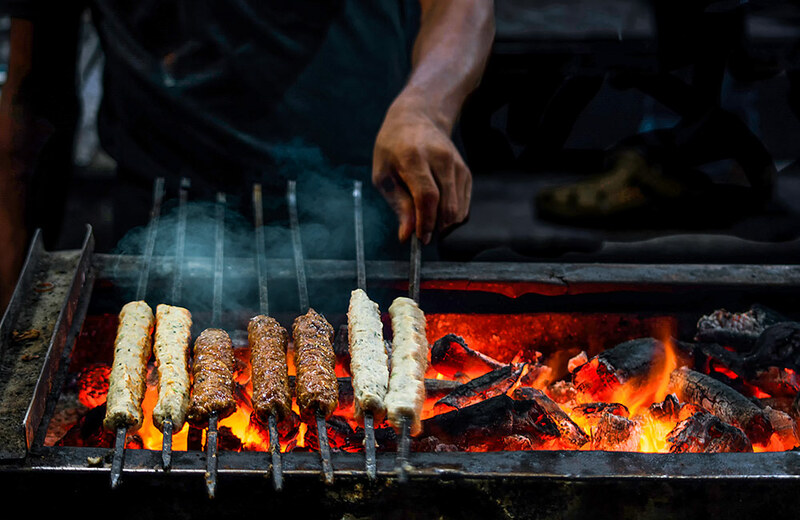 Walk through the Mohammed Ali Road and you will be transported to another world – the world of sizzling, melt-in-the-mouth kebabs. Taste these meaty treats once and you will start swearing by them. The same goes true for rolls, especially chicken tikka rolls and bhuna rolls. Spicy boneless chicken wrapped in thin roomali rotis, these rolls are the best street food in Mumbai to gorge at night. Some of the vendors like Bademiya are open till 03:00 am! Once you have had your fill, keep rolling; we’ve got more places to cover. What came first, chicken or egg? No one knows the answer to this mystery, but if you want to have both in one dish, we know the answer – Baida Roti. The word ‘baida’ means egg and this dish is an egg-based pan-fried envelop stuffed with more whipped egg, minced meat, onions, and spices. There are different varieties of this roti based on the type of meat used, so you could go for a chicken, mutton, or even brain-fry Baida Roti. Squeeze half a lemon on the roti, dip it in the green chutney or cucumber raita served along with it, and take a bite; you will feel the flavors exploding in your mouth. Nah, sandwiches are not something you would typically classify as quintessentially Mumbai food, let alone Indian food. Wait before you judge, my friend. The Mumbai or Bombay version is not your regular sandwich; it is prepared with ingredients you would least expect to find in a sandwich. Walk through any food street in the city, and you will see vendors preparing and plating up this street-side bestseller with dexterity. Like all sandwiches, the Mumbai version also has two slices of generously buttered white bread. 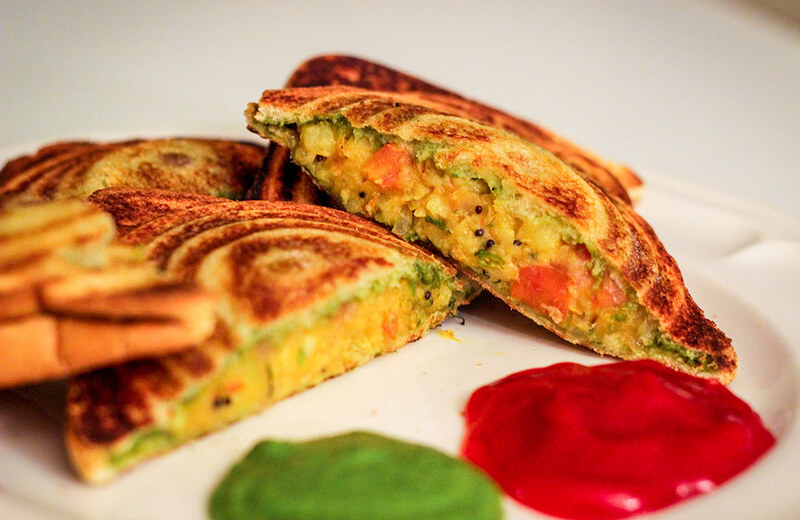 A mixture of mint chutney, beetroots, tomatoes, masala potatoes, and shredded cheese is stuffed between these bread slices. The vendor will cut it into triangles and serve it to you on a plate along with chutney. Each bite will fill your mouth with the most revitalizing tangy taste and redefine your idea of the sandwich forever. The dish also has a toasted version, crispy on the edges and steamed on the inside. 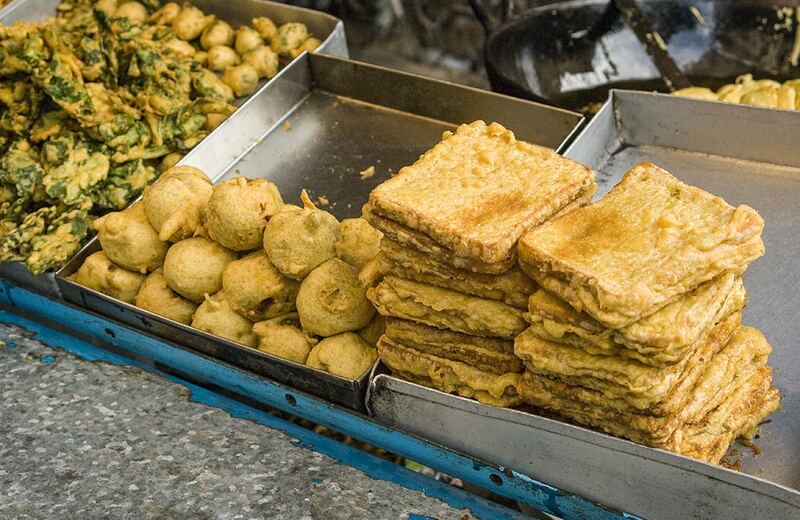 Literally translates into potato fritters, this is another delicious all-day snack from the streets of Mumbai. The word batata means potatoes, and no, the word is neither Hindi nor Marathi; it’s Portuguese! Remember, it was Portuguese who first introduced potatoes to our country. 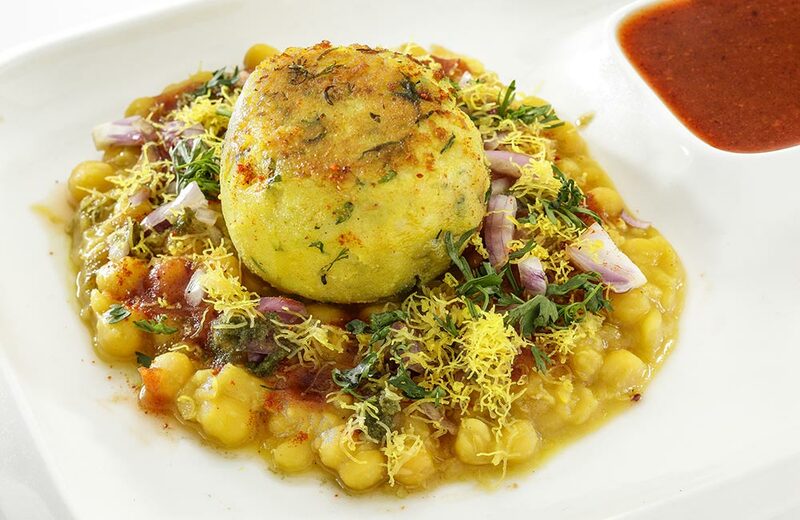 Consisting of a patty made of mashed potatoes and spices, which is then dipped in chickpea flour batter and deep-fried, the dish looks like a thick sphere. You will get one or more chutneys and green chilies as accompaniments; it is best had with a steaming cup of coffee or tea. Now that you have had a lot of spicy, tangy snacks, how about something sweet?! We would go for a glass of cool and smooth Falooda any day; and so should you. And the reason? It is ubiquitous in the city of Mumbai. From local vendors to 5-star establishments, everyone sells it, albeit in different forms and flavors. 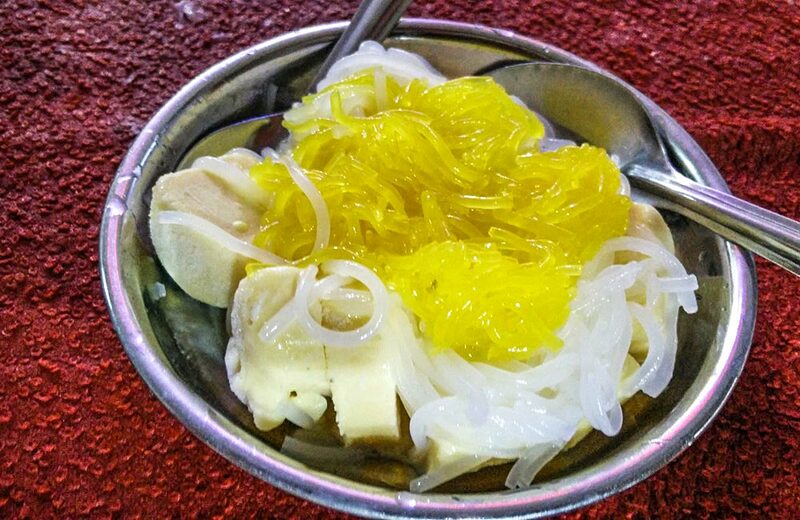 Even die-hard fans of Falooda still debate over whether it is a beverage or dessert, but does it really matter!? A royal favorite of the kings of Persia and brought to India by the Mughals, Falooda has a long and interesting history. Today, it is available in a wide variety, each boasting unique flavors. Typically, a glass of this rich dessert has layers of silky vermicelli noodles, rose syrup, jelly, vanilla essence, milk, almonds and pistachios, sabza or basil seeds, topped with one or two scoops of ice cream. Drink it on a hot summer day and you will have an instant cool down. We know this blog hardly does any justice to the rich and flavorful street snacks and dishes Mumbai offers to foodies. There’s certainly more to add to the list. From Misal Pav, Naan Chaap, Dahi Puri, and Sev Puri to Kanda Poha, Kulfi, and Akuri on Toast, a vast world of delicacies is waiting to be explored by you. Take your time, head out of your hotel in Mumbai, walk through the streets, explore your options, and taste all of these and more. Remember, when you are in the city of Mumbai, all roads lead to food.